"I thought it was at a safe distance. I was wrong." 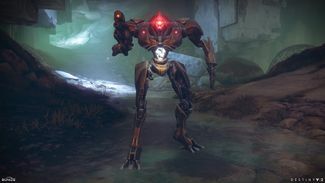 The Minotaur is a heavy Vex model and is harder to kill than any other bipedal Vex unit. Minotaurs are one of the deadliest Vex troops Guardians will encounter due to their explosive weaponry, unpredictable teleportation, and aggressive movements, but aside from combat most of their processing power is devoted to the physics of building massive Vex structures suspected to span multiple dimensions. Minotaurs are equipped with Torch Hammers, a devastating heavy weapon that fires projectiles of strange matter and mauls targets with exotic particle decay and deadly radiation. In combat, Minotaurs are fearless Vex that will always charge their targets while firing their Torch Hammers. They will also teleport erratically while flanking Guardians at different angles, making them a difficult target to pin down. To reinforce their armor, they are also equipped with a Void shield. One important thing to note about Vex Minotaurs is that unlike Vex Goblins and Hobgoblins, they lack an abdominal weak spot and although shooting a Minotaur's head off will disable its teleportation ability as well as its shield, it will only become even more dangerous - going berserk and firing their Torch Hammers in rapid succession while charging Guardians. In this state, they can punch through a Guardian's shield in seconds. In Destiny 2, Minotaurs now additionally employ the usage of the Vex Laser Rifle, which can melt through Guardian shields in mere seconds, making them even more dangerous than their first iterations. Their weak spots are also now visible. They also are more armored. Minotaurs are the only Vex units who have more than one eye as two more are located on it's shoulders.